This is the ClamBook, a super-sleek, airier-that-Air thingamajig that has a 16:9 widescreen, a keyboard, and a battery. 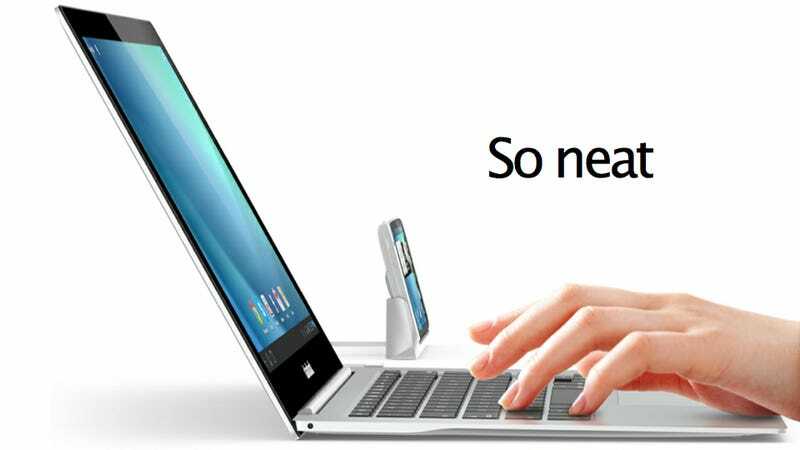 It will turn your iPhone or Android cell into a beautiful, ultra-thin laptop. Obviously, not as powerful as a real laptop, but as useful as many. There are no many technical details about it yet, though. They claim it will be available for the holidays, but there's no price and no specs. There is no description on how it works either. For Android I can see this happening system-wide, but for iPhone it will only really work with some applications, as the system itself can't be in landscape mode. In any case, it's a beautiful concept that I hope turns into a real product. I like the idea of carrying this around for some trips, rather than a MacBook Air.